The alternators work on the principle of electromagnetic induction. When is a relative motion between the conductors and the flux, e.m.f. gets induced in the conductors. The d.c. generators also work on the same principle. The only difference in practical alternator and a d.c. generator is that in an alternator the conductors are stationary and field is rotating. But for understanding purpose we can always consider relative motion of conductors with respect to the flux produced by the field winding. Consider a relative motion of a single conductor under the magnetic field produced by two stationary poles. The magnetic axis of the two poles produced by field is vertical, shown dotted in the Fig.1. Let conductor starts rotating from position 1. At this instant, the entire velocity component is parallel to the flux lines. Hence there is no cutting of flux lines by the conductor. So dΦ/dt at this instant is zero and hence induced e.m.f. in the conductor is also zero. As the conductor moves from position 1 towards position 2, the part of the velocity component becomes perpendicular to the flux lines and proportional to that, e.m.f. gets induced in the conductor. The magnitude of such an induced e.m.f. increases as the conductor moves from position 1 towards 2. At position 2, the entire velocity component is perpendicular to the flux lines. Hence there exists maximum cutting of the flux lines. And at this instant, the induced e.m.f. in the conductor is at its maximum. As the position of conductor changes from 2 towards 3, the velocity component perpendicular to the flux starts decreasing and hence induced e.m.f. magnitude also starts decreasing. At position 3, again the entire velocity component is parallel to the flux lines and hence at this instant induced e.m.f. in the conductor is zero. As the conductor moves from 3 towards 4, the velocity component perpendicular to the flux lines again starts increasing. 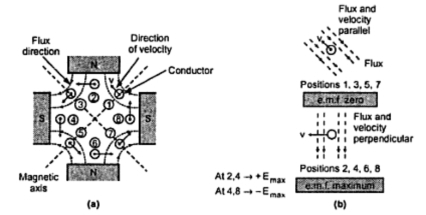 But the direction of velocity component now is opposite to the direction of velocity component existing during the movement of the conductor from position 1 to 2. Hence an induced e.m.f. in the conductor increases but in the opposite direction. At position 4, it achieves maxima in the opposite direction, as the entire velocity component becomes perpendicular to the flux lines. Again from position 4 to 1, induced e.m.f. decreased and finally at position 1, again becomes zero. This cycle continues as conductor rotates at a certain speed. So if we plot the magnitudes of the induced e.m.f. against the time, we get an alternating nature of the induced e.m.f. as shown in the Fig. 2. Fig. 2 Alternating nature of the induced e.m.f. This is the working principle of an alternator. We have seen that for 2 pole alternator, one mechanical revolution corresponds to one electrical cycle of an induced e.m.f. Now consider 4 pole alternator i.e. the field winding is designed to produce 4 poles. Due to 4 poles, the magnetic axis exists diagonally shown dotted in the Fig. 3. Now in position 1 of the conductor, the velocity component is parallel to the flux lines while in position 2, there is gathering of flux lines and entire velocity component is perpendicular to the flux lines. So at position 1, the induced e.m.f. in the conductors is zero while at position 2, it is maximum. Similarly as conductor rotates, the induced e.m.f. will be maximum at position 4, 6 and 8 and will be minimum at position 3, 5 and 7. So during one complete revolution of the conductor, induced e.m.f. will experience four times maxima, twice in either direction and four times zero. This is because of the distribution of flux lies due to existence of four poles. 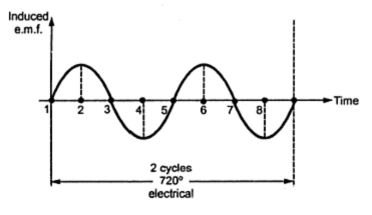 So if we plot the nature of the induced e.m.f; for one revolution of the conductor, we get the two electrical cycles of the induced e.m.f., as shown in the Fig. 4. Fig. 4 Nature of the induced e.m.f. Note : Thus the degrees electrical of the induced e.m.f. i.e. 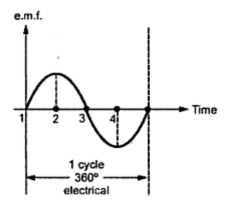 number of cycles of the induced e.m.f. depends on the number of poles of an alternator. 1.2 Frequency of induced E.M.F. N = Speed of the rotor in r.p.m. and f = Frequency of the induced e.m.f. One mechanical revolution of rotor = P/2 cycles of e.m.f. electrically. Thus there are P/2 cycles per revolution. As speed is N r.p.m., in one second, rotor will complete (N/60) revolutions. So there exists a fixed relationship between three quantities, the number of poles P, the speed of the rotor N in r.p.m. and f the frequency of an induced e.m.f. in Hz (Hertz). Note : Such a machine bearing a fixed relationship between P, N and f is called synchronous machine and hence alternators are also called synchronous generators. From the above expression, it is clear that for fixed number of poles, alternator has to be rotated at a particular speed to keep the frequency of the generated e.m.f. constant at the required value. Such a speed is called synchronous speed of the alternator denoted as Ns. In our nation, the frequency of an alternating e.m.f. is standard equal to 50 Hz. To get 50 Hz frequency, for different number of poles, alternator must be driven at different speeds called synchronous speeds. Following table gives the values of the synchronous speeds for the alternators having different number of poles. From the table, it can be seen that minimum number of poles for an alternator can be two hence maximum value of synchronous speed possible in our nation i.e. for frequency of 50 Hz is 3000 r.p.m.